When deciding to read your blog I had no clue what to expect because of it’s title. However, I found it extremely interesting. 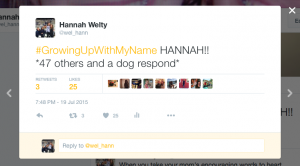 I actually know a lot of Hannah’s – one being my closest cousin – and she explains how she also knows a bunch of Hannah’s. Unlike you and my cousin, my name is very uncommon – Gulianna, with a G. Growing up I was the only ‘Julianna’ in my grade until my senior year, so whenever someone was saying ‘Julianna’ I figured they were talking about me. My mother decided to spell my name with a G, which is the way the Italian’s spell it since they do not have a G in their alphabet, because I am partially Italian. Yet, the end of my name is spelt how American’s spell Julianna, because she believed I live in America so I should have at least partially an American name. The older I got the more interesting I found when people thought it was strange to spell Julianna with a G. I find it very interesting how if I went to Italy no one would question why my name started with a G and instead would think of it as a norm. Here is a little discussion amongst people who talk about why Italy excludes some letters in the English alphabet. I fully relate to this post. My name is Rachel and I have yet to encounter a situation, whether that be in a classroom, work or social setting, where I am unique in my name. When I asked my parents the same question you did, about the origin of my name and its popularity today, I was met with the same answer of “It was not a popular name when you were born”. 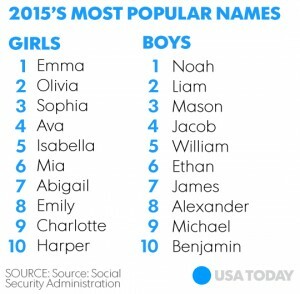 I have always been curious as to what drives baby name trends and your post opened my eyes to some options I have yet to consider. Some additional research I would be interested in seeing would be the breakdown of the influences of the name choosing process. I know that you mentioned family, social and other influences but to see a numerical data breakdown of just how much impact those methods have when choosing a name I think would really open the discussion up even farther. Also to look at that data across generations and to see if there has been a recent shift in the social influence and a decline in the family influence because that would be my initial hypothesis. 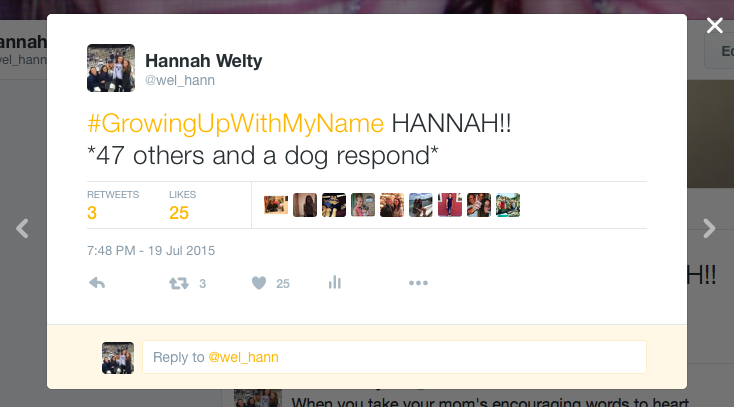 I relate to this completely (considering my name is also Hannah). Although i agree that our name is pretty common, I believe that there are so many names out there that are even more common. 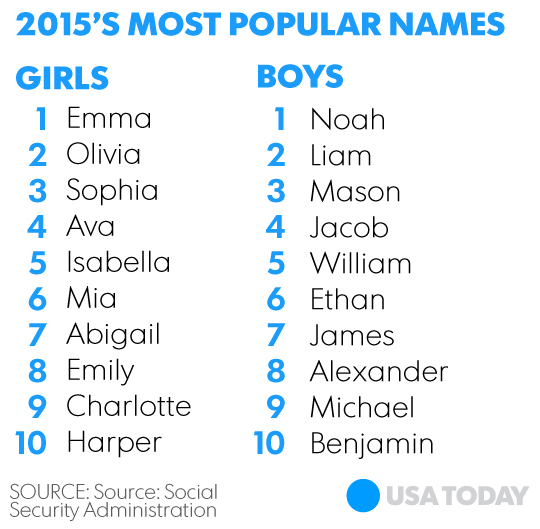 Heres a link to the top 100 names over the last 100 years: https://www.ssa.gov/oact/babynames/decades/century.html. You’d probably be surprised to find out that were number 77 on that list. So even though we’re pretty basic, at least we aren’t even in the top 50.